First we must gather the tools we need to begin our Daygown. We will need fabric, straight pins, scissors, a ruler, pattern weights and we need a sewing pattern. 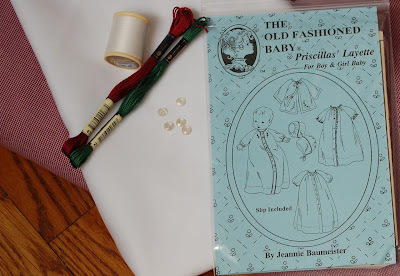 Pattern - I have chosen the Old Fashioned Baby Pattern "Priscilla's Layette", (View 2 shown above in white fabric with blue bias binding at the neck and sleeves). Besides being a really cute little Daygown, it has raglan sleeves. 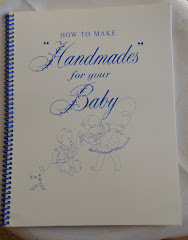 They are simple to sew and they fit different size babies very well because they do not have shoulder seams. I will use View 2 for my first project. 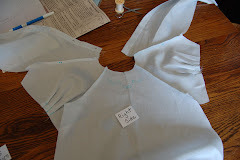 In this picture you see the pattern, five Mother of Pearl Baby Daygown buttons and the white Lawn fabric I have chosen. 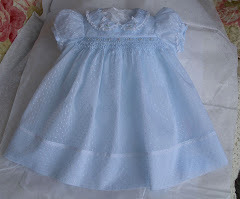 I am making this for a Christmas baby so I will use red/microcheck fabric for the bias binding at the neck and sleeves. You also see the spool of white thread I use for sewing. 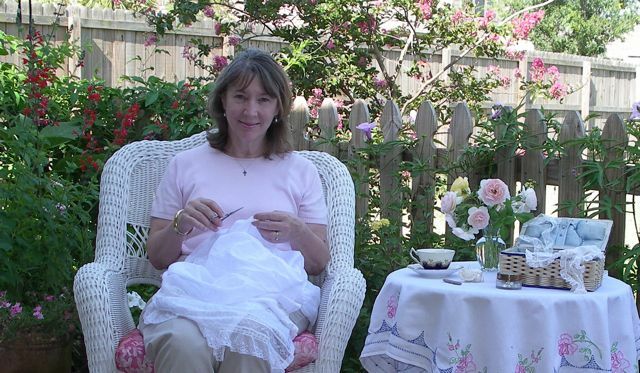 I have selected 2 skeins of floss for the embroidery, although at this point I don't know what design I will use. You can find this put together as a kit for you and can choose the red shown here or blue or pink for the bias binding. Fabric - I love cotton! It breaths and it is so comfortable. We want our baby to be comfortable as well as beautiful in his clothes! You just have to feel so sorry for those little babies who are dressed in jeans. I think their parents should get into bed fully dressed (in jeans) and stay there 24 hours a day for several days so they will really know how uncomfortable their little one is. 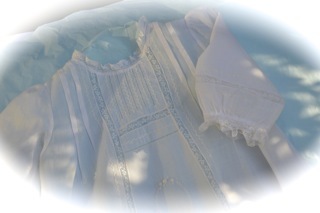 Our Daygown will be a soft Cotton Lawn. Notions - Don't skimp on quality. If you purchase inferior products, you'll have inferior results. 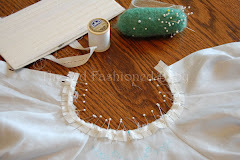 I recommend thin "Silk" straight pins with a glass head, good quality cutting shears and a ruler. I like to use my Wrist Pincushion to hold the pins because it is so handy but any Pincushion will work. 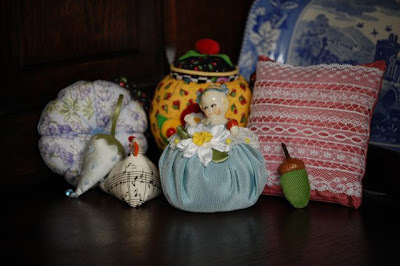 Below are some of my favorite Pincushions, given to me by friends and students. I love Pincushions!! Jeannie, thanks for letting me know about your blog. 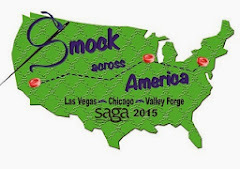 Cannot wait to sit and sew with you for a few days at SAGA. BEAUT-I-FUL blog Jeannie!!! I am so impressed with all the details on this blog. You put that silly blog I had to shame. 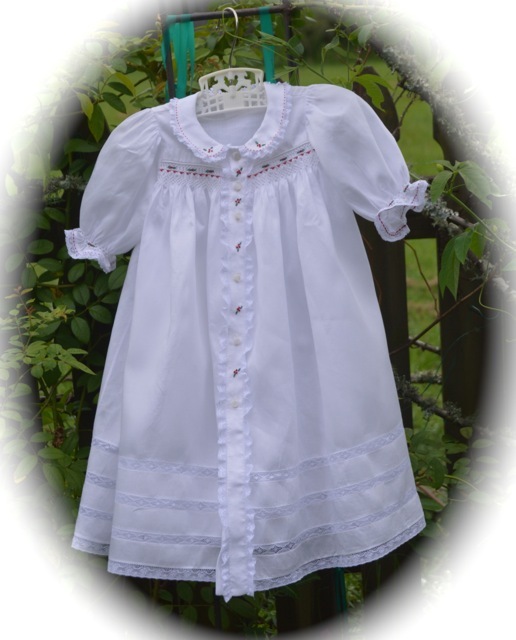 Your baby clothes are the most lovely I have ever seen-the craftsmanship amazing. Your photos are wonderful too. Excellent job on everything you do!!! I will be checking back often! Great Job! We were just talking about your Blog last week and there it is. 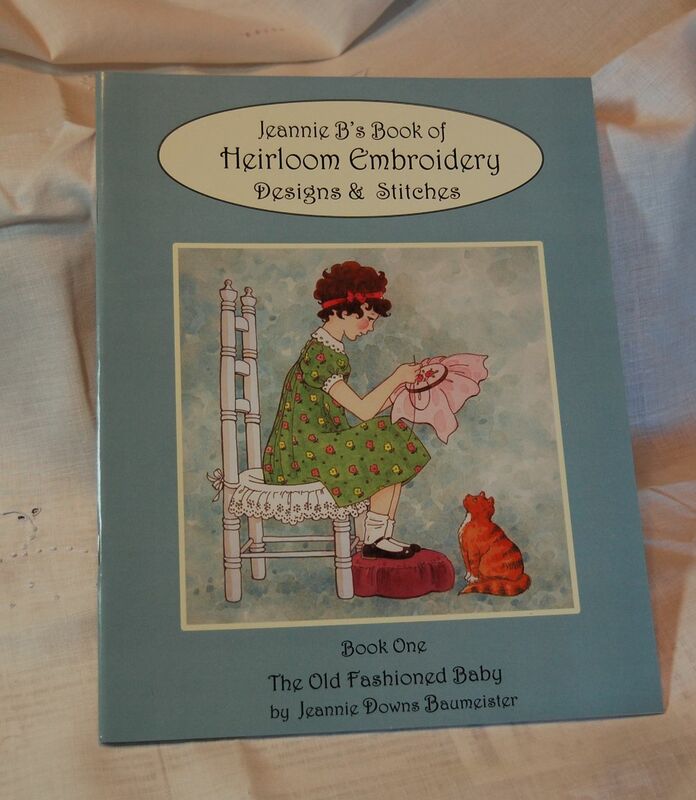 Looking forward to stitching with you soon. Your new blog is terrific! 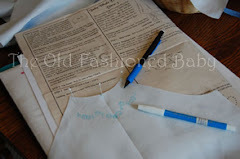 I have my pattern and fabric at the ready and look forward to creating this sweet daygown with you! I am going to add your blog to my blogroll so that more are made aware of this lovely blog! By the way, those pincushions are beautiful! Thanks for letting me know about your new blog. It is so very nice, beautiful to look at and full of information. I am sure everyone will love it! We are really enjoying your antique pieces and everyone who comes into the shop gets to enjoy them also. 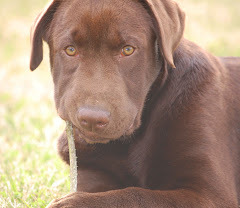 We would love for you to come to see us sometime, the Saturday class sounds great to me. I am so glad you have started a blog! I look forward to what is to come. 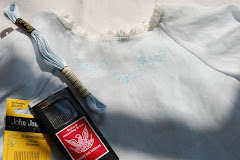 Your blog has inspired me to pull out my UFOs and finish them (or at least try to finish them) including two partially finished daygowns from Priscilla's Layette. I guess these will go in my great grandmother hope chest for the future. 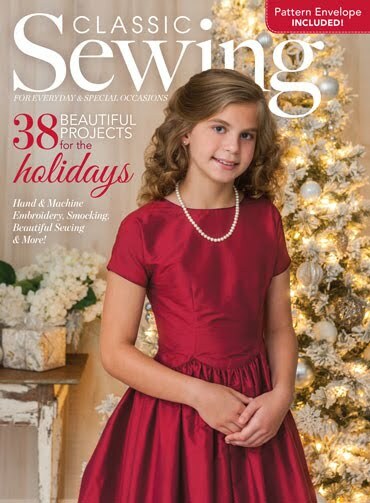 I have recently bought Industrial Sewing Machines, buy I am beginner and start working as sewing. Your post helped me to go to next step. Thanks for sharing your experience.